Rosin Plate Starter Kit 4"x3" - FREE Shipping! > » Rosin Plate Starter Kit 4"x3"
Product Code: Rosin Plate Starter Kit 4"x3"
0 reviews Write a review for Rosin Plate Starter Kit 4"x3"
We designed the Complete Pressing Starter Kit with the new producer in mind. 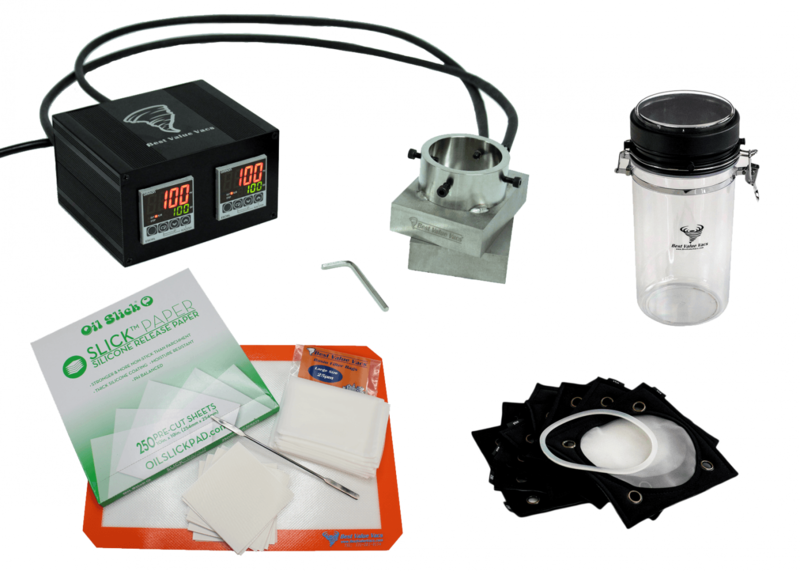 Bundled with our most impressive Rosin Press yet, this Kit provides you with all of the accessories you need to get up and running at a discounted rate. Featuring nearly $200 in tools and accessories, start your operation right with the Complete Pressing Starter Kit. Rosin, solventless oil, is made by putting plant material under heat and pressure. At Best Value Vacs, we've mastered the art of Rosin and our presses are the best in the industry. Our Rosin Presses use precision, feedback-control heating and plates are designed for ideal heat transfer to your medium. After manufacturing and testing of each unit to the highest quality control standards, we offer a satisfaction guarantee and 90-day warranty so you can press with confidence! Attach the plates to your own shop press using the hardware provided and convert your shop press into a commercial-grade rosin press! Custom rosin platens are essential for both the commercial producer and serious enthusiast alike. There's simply no better alternative- attach these high-quality, stainless-steel heating plates to a press to give yourself complete control over every element and variable in your process. We use dual heating rods, SS316, and the latest in thermodynamics technology to ensure a stable and uniform temperature across the entire plate's surface. There are no reviews for Rosin Plate Starter Kit 4"x3"
Write a review for Rosin Plate Starter Kit 4"x3"